This post is off the normal fiber focused subject......so read on at your own peril! This is an excerpt from the book "Nightwoods" written by Charles Frazier. You might be aware of his others, "Cold Mountain" & "Thirteen Moons". The books deal with areas in Western North Carolina and Haywood County, where we live. "The husband" has been reading this book and was struck by the following passage. From day one of moving here, we noticed this unusual tree in the common area of our development. The questions are: Could this be natural? If not, who did it? Where does it point? "Farther on, along a stretch of trail Luce had walked at least a dozen times, she noticed something new to her, A stout old oak partly screened by younger trees, the first four feet of its trunk hollow and the crown nearly dead. 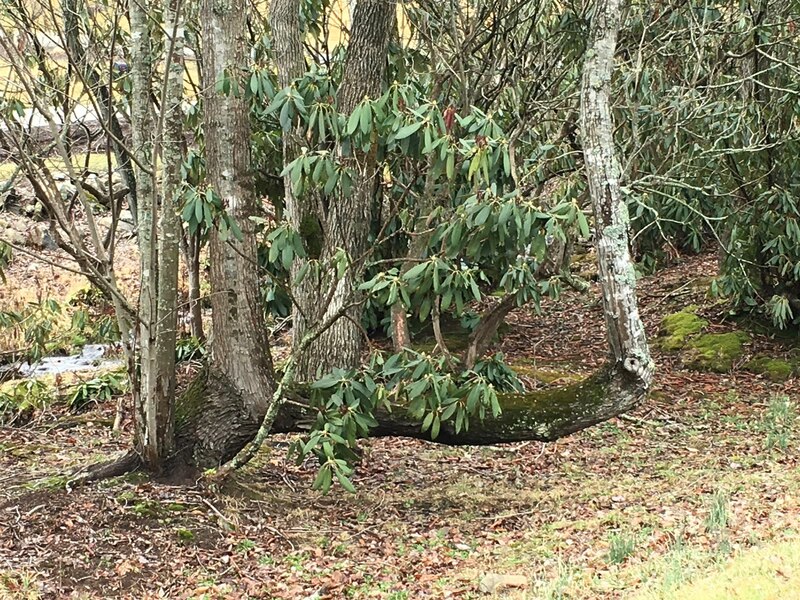 What Luce first thought was a low limb, much thicker than her torso, ran parallel to the ground and then made an unnatural upward right angle. At the L, a knob of scar. It turns out there are similar trees that run all across this country. A fledgling rhododendron partially obstructs the drama of this tree which grows along side one of the 3 small creeks that run through our development. YET the nose is quite clear right side of horizontal limb). There are groups that research such trees for authenticity. We've submited this one and are looking forward to hearing their opinion. It doesn't appear to be 100 years old but who knows. Follow these two links here and also here if you'd like to read a tad more about this interesting navigation system most often attributed to Native Americans. That is so interesting and neat to learn about. Thank you and for the links too! 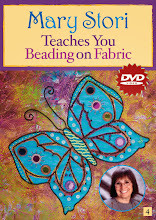 WOW...now we get history lessons in addition to quilting tips/techniques! Love your posts! That's so interesting- and thankfully the developer didn't bulldoze the tree when building! I've seen trees like this, but never considered they were anything other than some natural phenomenon. Yes Nancy.....it's fortunate the tree survived......though it truly seems like a trail tree.....we will await confirmation from the experts. Our area was inhabited by American Indians for centuries....in fact the Cherokee Indian Reservation is only about 40 mins. NW of where we live. Another clue besides the look of the tree is it's location......many trails/resting stops etc. were along side water ways.....and our tree is right along side one creek and very close to a second intersecting one. Quite fascinating!